For more information or a Free Initial Office Consultation CONTACT US. Two of the issues that have dominated our nation for the past two years have been the economic downturn and the desire for ecologically sound, or "green," ways of doing things. Both of these issues have had a major effect on the construction, housing and real estate industries in both the High Country and the rest of the country. One construction firm, Mountain Construction Enterprises, has helped lead the way on how business can not simply adapt to new situations like these, but can actually flourish in them. The economic downturn has led to a slower market in new house construction and many developments in the High Country are on hold. Many home buyers are opting for older houses, which might need some work, while others are looking to remodel their existing homes. 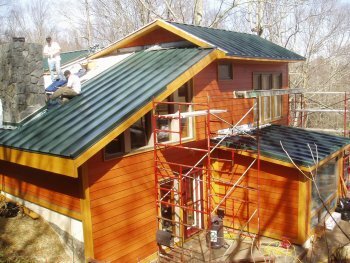 Mountain Construction Enterprises owner Mark Kirkpatrick has turned these remodeling jobs into an opportunity to introduce homeowners to the beauty and economy of "green" building techniques. With energy costs seemingly rising every single year, more and more home owners are looking for ways to keep the heat inside their house in the winter and outside of it in the summer. 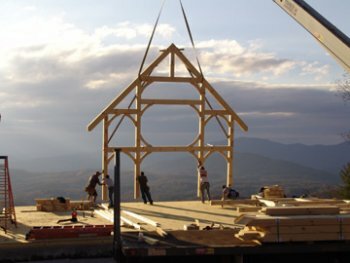 Mountain Construction Enterprises is also working with homeowners to capture the energy of the sun by building and remodeling homes with rooftop solar panels. NC GreenPower currently pays homeowners 15 cents per kilowatt-hour and Blue Ridge Electrical Membership Cooperative (BREMCO) pays homeowners 3 cents per kilowatt-hour for energy produced by home solar panels. But green building is much more than the use of solar panels. 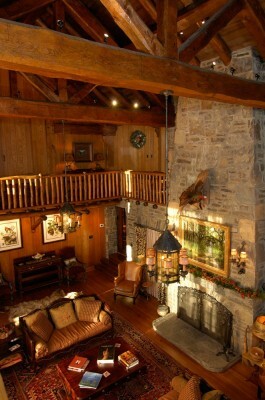 Mountain Construction Enterprises utilizes various techniques from the acquisition of basic materials to the energy consumption of the final product to help its customers maintain a small carbon footprint with their homes. The company also works with third party verification organizations that provide "Energy Star" and "NC Healthy Built Home" ratings. "We believe it is important to limit the impact on nature when we build a home," said Kirkpatrick. "We strive to select materials that are manufactured with careful consideration. We are dedicated to providing our clients with product options that take as little as possible from the environment." When work is finished at a job site, the company also recycles as much leftover job site materials as possible. 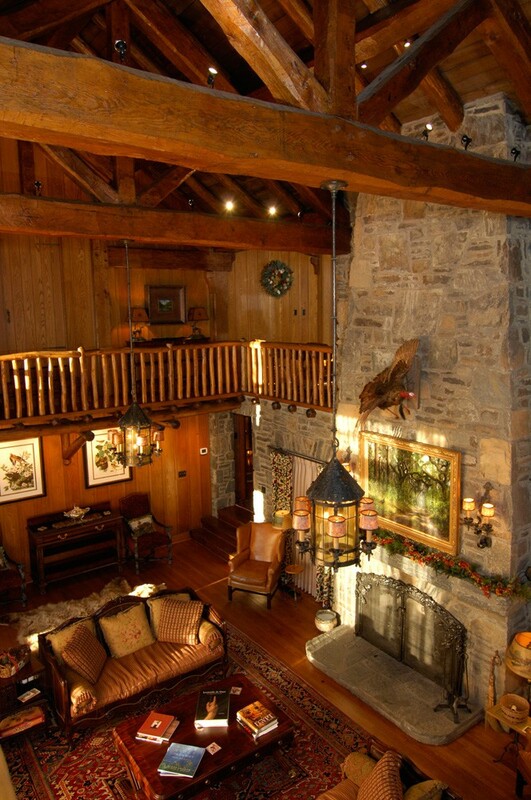 In Blowing Rock, Kirkpatrick and Mountain Construction Enterprises are well known for both new home construction and restoring some of the town's signature houses. One of those landmark homes was the Joseph and Annie Cannon home, first built in 1927 and known as "Miramichi" (happy retreat). Situated on the edge of the Globe, Miramichi has been subject to the forces of time and the elements for decades after Annie Cannon passed away in 1965. When it was finally purchased in the early 2000s, the new owners were wary of any remodeling jobs that might be needed, for fear that they would take away from the building's original charm and style. "When I first met the new owners, it didn't take long for me to clearly understand that they had no interest in a remodel," said Kirkpatrick. "Their intent was restoration of the home to its original grandeur." Fortunately for Kirkpatrick and his team, the original building was solidly built over eighty years ago. "The workmanship and structural integrity of this building is phenomenal," said Kirkpatrick. "The only reason we're having to spend so much effort now is because it sits as a breaker for every storm that comes up out of the gorge, and the years have taken their toll on the superficial elements. Basically, the guts of the building are as sound as the day they were built." Since the successful restoration of Miramichi, the home has been to a number of special events and home tours. This past summer Mountain Construction Enterprises remodeled a number of historic homes in Blowing Rock in the Country Club and Gorge Overlook neighborhoods.